I need to know if there is a better workflow out there. I'm currently capturing HDV as ProRes422 and passing it via external drive to my editors. I usually give them 3 weddings per drive and that fills up the drive. I also keep a copy on my Mac Pro. I have 3 editors working at all times, so thats a lot of weddings to keep stored. I also keep the original files on the computer for 4-5 weeks after delivery to the bride, just in case there are any problems. My job seems to have changed to data wrangler at this point. I've been told editing in HDV is slower than ProRes422, but this file size is killing me. Any thoughts? Great question.But an incomplete question perhaps? - what "external drive" are you using for capture? - Please review this work-flow diagram. Ca you tell us what the rest of your turnkey system looks like? I shoot HDV (Canon 24F mode with XH A1), capture in the HDV 1080P24 setting, edit in a 23.98 HDV timeline, export to whatever I need using Compressor. FCP handles HDV perfectly well, so I don't see any need to do it any differently. You should consider capturing in HDV and having your editors set their render settings to ProRes. This way you save drive space (and transfer time) and maintain quality in the one place where HDV falls apart in quality and time, renders. I know when editing HDV, the quality can begin to get a bit unglued. If you use HDV for your source, but render out to Prores or cineform (plugins), will the original HDV file be affected? I know this might sound a bit silly, but it is something I've never read an answer to. But I thought the whole point of ProRes was to get it captured to this codec to edit in to preserve quality while adding effects, color correction or whatever. Simply rendering to ProRes (from HDV) after all the editing seems to me would be missing many of the advantages of the ProRes format. And if you capture to ProRes to begin with, at least you only have those files to worry about begin with. When working with HDV, the compression is done in the camera before the data is written to tape or outputted via firewire. The loss due to HDV has already occurred. When you transfer HDV to your NLE by firewire, there is no additional loss (just like copying a file bit-for-bit). When you put these HDV files on your HDV timeline with only cuts, there is still no loss because you aren't recompressing the data. The only time you get loss is when you have to make changes to the video, such as when using filters, titles, transitions, etc. If your timeline is set to render to the HDV codec, then any parts of your video that are changed will be decompressed, have the changes applied, and then recompressed in HDV (but other parts which are unchanged will remain in their full original quality). It is this recompression step that causes loss, since HDV is a pretty lossy codec. It also makes editing slow, because decoding and recompressing HDV is a lot of work for your CPU to do. The advantage of this workflow is that it uses the least disk space, and unchanged parts of the video incur zero quality loss. So this is a good workflow to use when doing mostly cuts-only editing with minimal rendering needed. If you use a HDV timeline but with the render codec set to ProRes, then this is what happens. Parts of the video which are unchanged will stay in HDV as they are without any recompression, so there is no loss. Parts that are changed will be rendered in ProRes instead of in HDV, which minimizes the loss. This workflow gives you most of the advantages of the pure ProRes workflow, but uses much less disk space (since your source files stay in HDV which takes much less space than ProRes) and doesn't lower the quality of unchanged parts of your video. The downside of this workflow (compared to pure ProRes) is that, since HDV is harder for your CPU to decode in realtime, you get slightly fewer realtime effects before needing to render. The upsides are that rendering is fast because ProRes is relatively easy to compress, you get minimal quality loss in changed parts of your timeline (and no loss in the unchanged parts), and the disk space required is only slightly higher than with the pure HDV workflow. The pure ProRes workflow involves transcoding the HDV data that comes over firewire into the ProRes codec, so the files on your disk are all in ProRes instead of HDV. Since ProRes is a (slightly) lossy codec, this means ALL of your video will LOSE some quality (although the loss will be pretty small). While it is true that ProRes is a higher quality codec than HDV, transcoding HDV into ProRes doesn't increase the quality, it only gives you the compression artifacts of HDV PLUS the artifacts of ProRes. This also requires a great deal more disk space, because ProRes uses something like 4-8x the bitrate of HDV. The advantage of this workflow is that since ProRes is easy for the CPU to decode and encode in realtime, you can have more realtime effects and faster rendering than with a pure HDV or mixed HDV/ProRes workflow. The downsides are that all of your video loses a little bit of quality and much more disk space is required. Thank you Jason. Couldn't have explained it even close to the way you did. How would you go about creating a ProRes and HDV? - How noticeable to the customer is the degradation of quality in areas of the edit that have been filtered/transitioned? I guess three clips from the three different options would be great to review. - Is the additional disk space that's required for a totally ProRes edit paradigm always worth the extra expense or extra physical drive arrays? - Seems like the pure HDV and mixed capture/edit paradigm advantage laptop-based edit turnkeys? The render degradation is very noticeable if you pause the timeline in a pure HDV timeline. A client isn't always the best reason to skimp. Sometimes you want something good to show. The additional disk space is needed if your project requires it. Put the cost of the drives in the project. A multicam switch is better in full ProRes. A standard edit job works great with the HDV/ProRes render setup. If I understand you then yes, HDV works great on laptops for standard editing jobs. 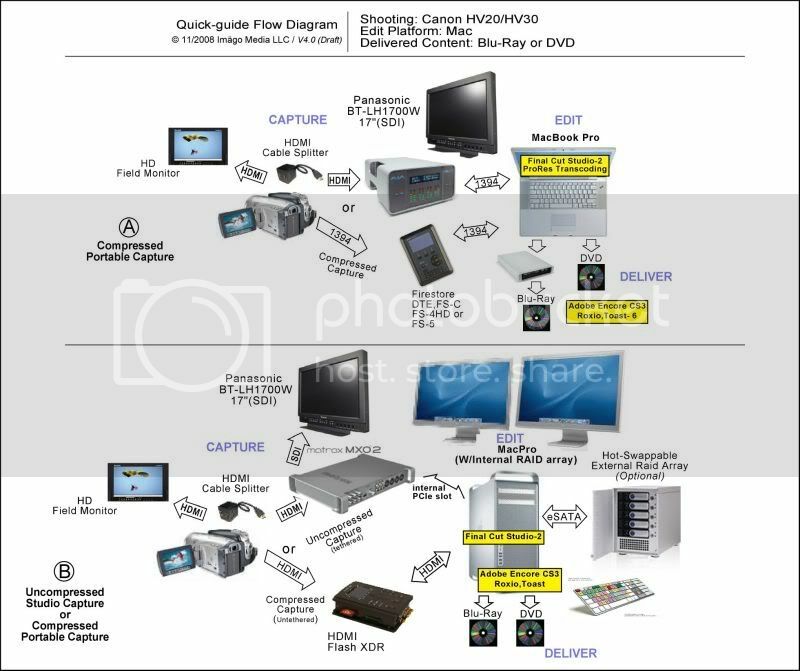 Dont you need a card like decklink or kona to capture prores it cant be done via firewire is this correct? Incorrect, the capture from FW is the HDV signal that gets printed to Prores format if you choose to use it. It is like transfering one format to another format, you are not capturing Prores, but transfering to it while capturing. I just read your post Jason, as this forum was not sending emails when posts are followed up on. But you in your wonderful explaination of pros and cons of Prores/HDV codecs did not address the issue I brought up. We are talking about editing, and not what are the shortcomings in HDV at the camera stage. And that is that rendering out to Prores after editing/composing/transitions, etc. defeats the purpose of Prores. My posts stated that you must get in Prores before doing these things to take advantage of the codec, and not simply render out to prores. You did not address this issue. But nobody seemed to notice anyway.